Most of us are extremely unlucky, when it comes to find any unknown treasure. The highest value treasure that I have ever found has been a Rupee 5 coin (worth about 8 cents) lying on a curb. I was however too scared to pick it up because of the fear that someone else may see me and would form a bad impression about my financial status and just let it go. With a perfect Zero score on my progress sheet in this subject, I often wonder with awe and amazement, when I read about other people finding fantastic treasures underground. Take the case of Mr. Terry Herbert of Burntwood in Staffordshire, England, who had found 5 Kg of gold articles from a period around 700 CE, under a farm, belonging to his friend. One thing however differentiates likes of Terry Herbert and rest of us. Terry Herbert is an experienced treasure hunter and has years of experience of hunting for hidden treasures and moves around with a state of art metal detector. Nothing can however beat the story of the treasure found by a California couple last year, who are identifying themselves only as John and Mary for their personal safety and security reasons. John and Mary are 40 plus- middle-aged and have their rural property in a sprawling hilly area of Gold Country, where they have lived for several years. The couple’s property sits in the region, where prospectors flocked from around the world following the discovery of gold at Sutter’s Mill near Sacramento in 1848: the California Gold Rush. As a part of their daily routine, John and Mary, walk their dog through a section of their property that they have named as Saddle Ridge, every day. On their way, they pass by an old tree growing into a hill. Many years ago, they had noticed an empty rusted can hanging from one of its branches. John says: “We thought the can might be a place for someone to put flowers in for a grave site.” Some kind of site marker. One day last February (2013), the couple was walking on this section of their property, along the path on which they had walked for years. However, on that day, while strolling past the tree, the dog suddenly rushed to a spot, where Mary could see an old rusty can that had popped slightly out of the ground due to soil erosion. Being curious, Mary walked to the spot and bent over to inspect what was pooping out of the ground. Mary was slightly annoyed as John told her: "Don't be above bending over to check on a rusty can." But something in the can interested her, so she called John for help and together they dug the heavy vessel out with a stick and carried it home. 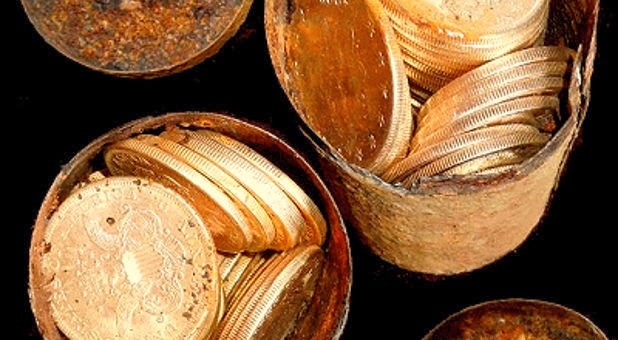 To their utmost surprise, they found the can filled with 19th- century gold coins. After realising, what they have found, the couple raced back to the tree and dug up seven more rusted cans, scattered across that section of the property at different depths, suggesting that they all were not put there at the same time. The couple were so shocked by their find, that their first response was to rebury the coins under their woodpile, while they decided how to proceed. John then realised that the old rusted can hanging from the tree was definitely a marker, but not a grave marker, as he had thought earlier. The horde in all, had more than 1,400 rare and pristine US coins dating from 1847 to 1894. It has a face value of more than $28,000, but rare coin experts say that it could eventually fetch more than $10m. A single coin from this hoard – the 1866-S No Motto Double Eagle – itself is valued at around $1m. The coins were later authenticated by Professional Coin Grading Service of Santa Ana, California, whose co-founder David Hall said the majority of the coins were uncirculated and in mint condition. The 1,427 coins came in $5, $10 and $20 denominations and were mostly minted in San Francisco. Attempts to identify the coins’ original owner have so far proved fruitless. The newly rich couple wants to remain anonymous, firstly to avoid a renewed gold rush to their property by modern-day prospectors armed with metal detectors. Secondly they also don't want to be treated any differently. Their concern is that this wealth would change the way everyone else looks at them, and they're pretty happy with the lifestyle they have today. They plan to put most of the coins up for sale through Amazon, while holding onto a few keepsakes. They'll use the money to pay off bills and quietly donate to local charities, that support the homeless and hungry in their area. Paper money was illegal in California until the 1870s and it is extremely rare to find any coins from before that of such high quality. The coins, in $5, $10 and $20 denominations, were stored more or less in chronological order, with the 1840s and 1850s pieces going into one canister until it was filed, then new coins going into the next one and the next one after that. 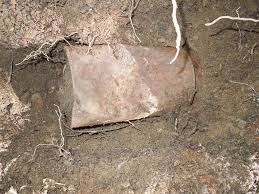 The dates and the method of storage indicates that whoever put them there was using the ground as their personal bank and that they weren't acquired by some illegal acts like in a robbery. 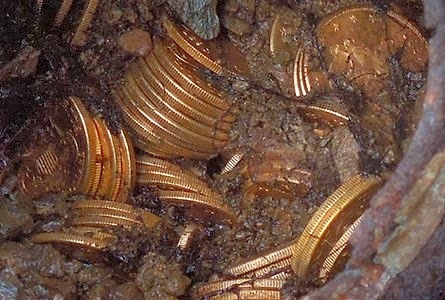 The rich haul of gold coins has been now nicknamed as Saddle Ridge Hoard.